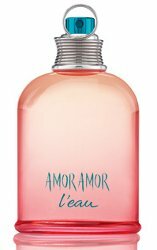 Cacharel has launched Amor Amor L'Eau 2015, a new limited edition summer flanker to 2003′s Amor Amor. You can see the 2014 version here. Notes for the fresh gourmand include cola accord, grapefruit, jasmine, rose and musk. Cacharel Amor Amor L'Eau 2015 is available now at Nocibe in France, in 50 ml Eau de Toilette. Lovely color! And cola accord sounds fun too! They used the cola accord last year too…that was a pretty blue bottle.